A shrimp-filled dumpling, wrapped in thin, translucent dough and shaped to look like a rose. Also usually served with a delicious sweet dipping sauce and sprinkled with fried shallots. This is a classic, served everywhere, and we didn’t eat a bad version. Where have you been all my life?! A dish synonymous with Hoi An (the only city you’ll find it made in), it’s the perfect bowl of chewy noodles, fresh green herbs, tasty pork, crunchy fried noodles, and easily the most flavourful broth I’ve ever tasted. Again, we tried several bowls of this – you can’t get a bad version. They’re all over the country, and they’re all delicious. We found them to be the perfect breakfast, costing us only a few dollars for some crispy shelled, pillowy soft baguettes stuffed with BBQ pork and all the fixings. Take a stroll down the street in the morning and pick one up as you walk in to town. Every time we walked past this lady’s cart, we stopped so I could get one. 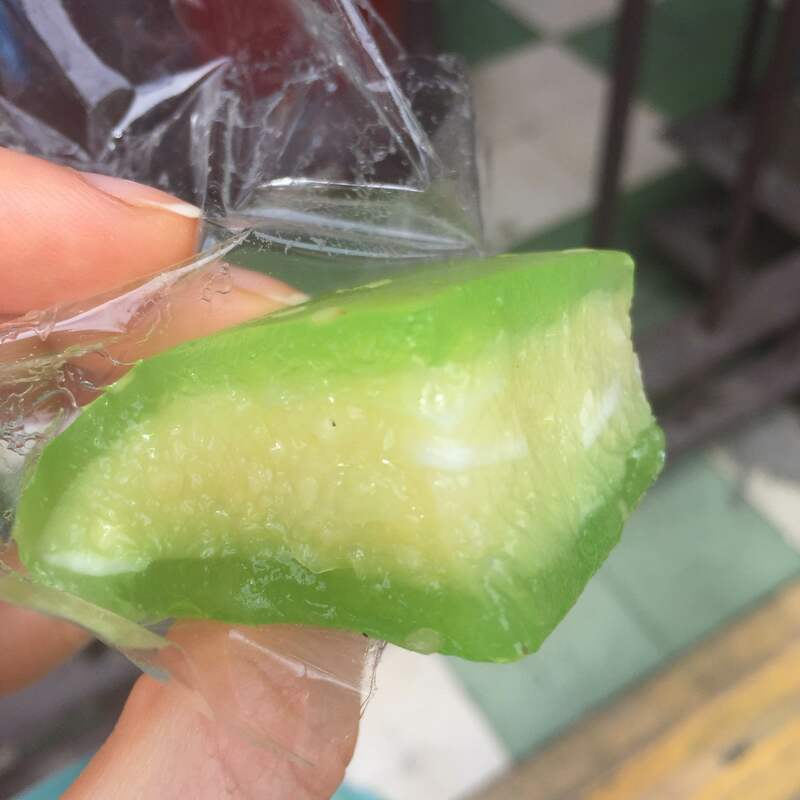 Gelatinous, gooey, pandany coconutty goodness, they were the ultimate sweet fix in such a hot climate. But they’re sticky as hell, so bring some anti-bacterial gel with you, or you’ll stick to everything you touch for the rest of the day! There are a few places that’ll help you out here, but my hands down favourite is Bale Well. I wrote about it a few years ago when my sister and I visited, and it was one of the first places on my list to go back to. 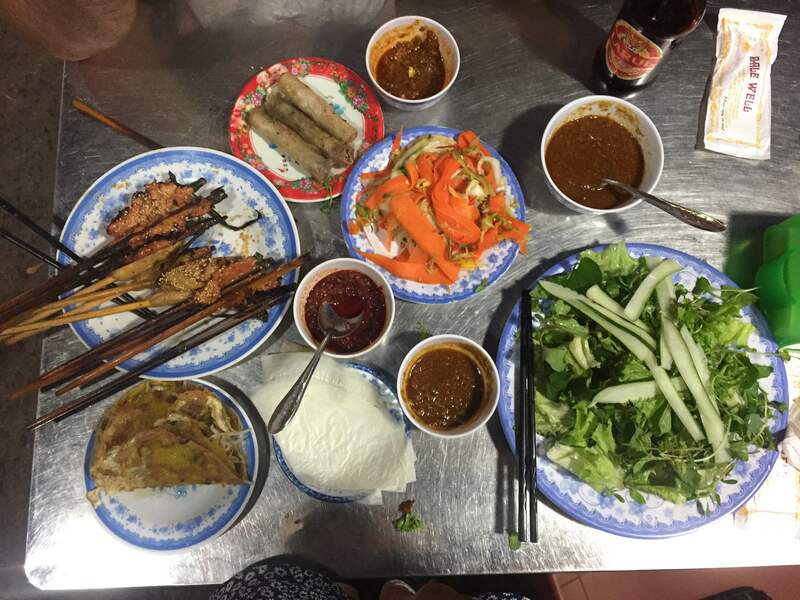 Rice paper to wrap, freshly fried spring rolls, pork skewers, kimchi-style pickled veg, a mountain of fresh greens, banh xeo, bowls of dipping sauce, and a drink each set us back all of about AUD$12.00. And we were utterly and completely stuffed by the end of it. Don’t be put off by it’s location down a dark alleyway – this is the best cheap feast in the city! 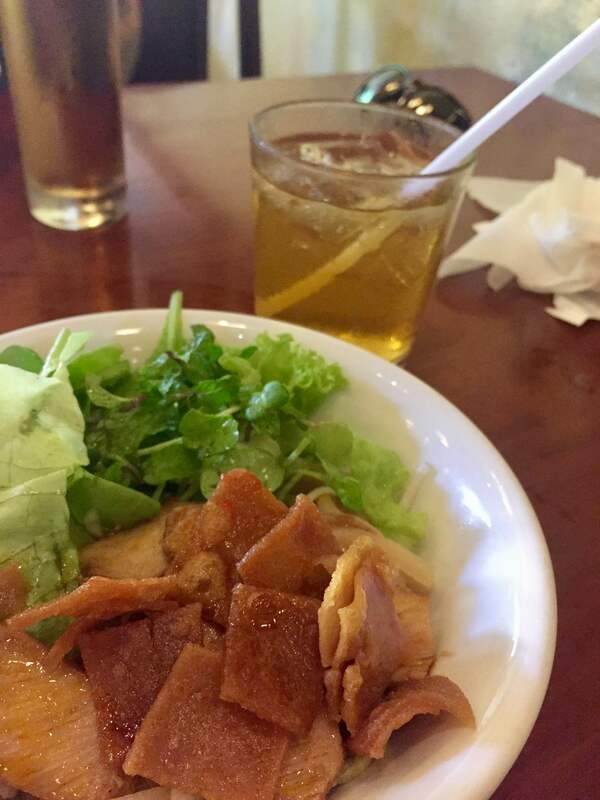 I will never forget the Cau lau in Hoi An – the texture of the noodles and crisp pork in particular. And the baguettes! 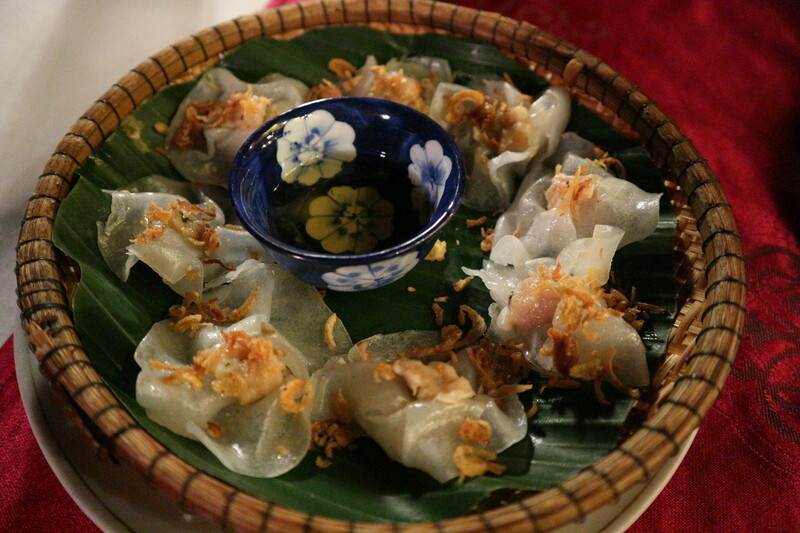 We ate these all through Vietnam, but none blew our mind quite like the ones in Hoi An. 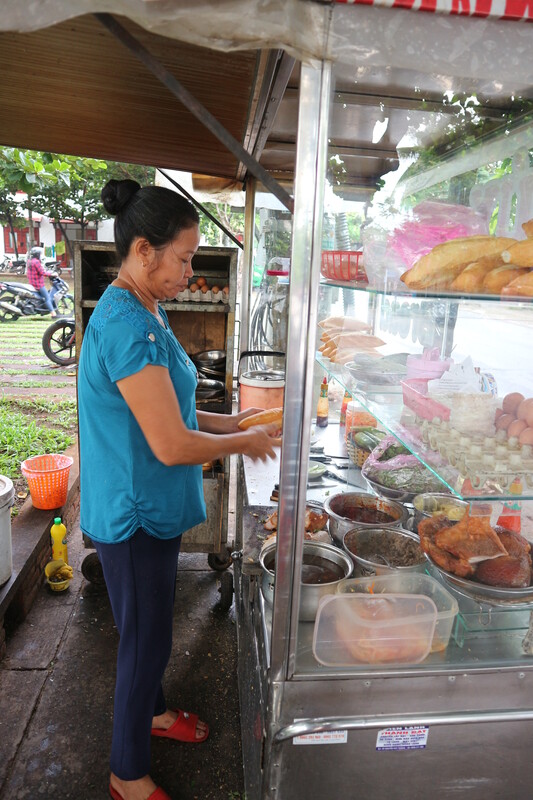 There’s nothing like that cao lau… I wish it was as popular here!! I know…I’ve never seen it on menus at Vietnamese restaurants in Brisbane. I’ve found ONE in Melbourne so far… I guess we just need to go back to Hoi An! !